For too many people, problems, roadblocks, or failure to find the right path stand in the way of success. 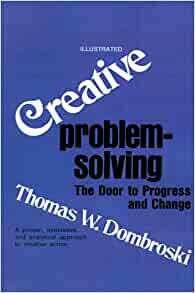 In Creative Problem-Solving, Thomas W. Dombroski shows us how to remove the roadblocks by attacking problems creatively and clearing away outmoded strictures that straitjacket our thinking process and inhibit new approaches.After stressing the importance of attitude in approaching problems, Dombroski breaks down the problem-solving process into five phases and illustrates each phase with puzzles, examples, diagrams, and other techniques of reinforcement.Creative Problem-Solving effectively blends psychology with hard-nosed business practice. Thomas W. Dombroski, president of D & L Consultants Enterprises, Inc., a management consulting firm, graduated from King's College in Wilkes-Barre, Pennsylvania, and did graduate work at Wilkes College. For ten years he was a senior process engineer with General Telephone and Electronic, Sylvania Electric Division. In 1965, he formed his management consulting firm. Mr. Dombroski has taught a course in problem-solving at various public agencies to businessmen, social workers, and community development personnel. He also taught his course over radio station WRKC-FM in Wilkes-Barre. In addition, he has a wide background of experience in management-consulting services, particularly for small businesses in the commercial-industrial fields. 1.0 out of 5 starsWow! This completely underwhelmed me. I was a looking for a book on problem solving techniques and bought this book among others. While it became clear that this was a book written to help people live a more successful life, I dare anyone to use the disjointed subjects in this book to effect a better future. I certainly did not get anything of value out of this book before I gave up reading it. For creative problem solving techniques, I found Think Better by Tim Hurson to be a much, much better book. Great book to use with the class for a national competition. The competiton is for a critical thinking team event. 3.0 out of 5 starsAn ok book by my account! Nothing in it I didn't know before. But a worth read if you're serious about getting into the creative crowd. 5.0 out of 5 starsA Very Innovative Book. This book reminds me of an interpersonal class I took at college. In one of the chapters I believe it's chapter # 8 Mr. Dombroski talks about the conscious & subconscious mind. We as Americans are so worried about proper adequate that we fail to be creative. We are subconsciously so worried about how are opinions look that we fail to be creative. Thomas W. Drombroski has written a book that literally everybody should read. This book shows the reader that they're really is no boundaries as far as being creative. Who says you can't color outside the lines? I have every intention of going back to what I've should have been doing and being creative and not worrying about how my ideas look to other people. The book is set up like a college text with excercises and examples. The book is worth the little price Amazon wants for it. The Author Mr. Thomas W. Dombroski has earned my utmost highest respect for reminding me how to be creative. It'll do the same for you. I suggest you buy it.